The history of World War II is so varied and multi-faceted. There's always another aspect to consider, another story to learn, another battle to deconstruct. In the past few years I've read dozens of books set right before, during or right after World War II and they all tell such astoundingly different, and astoundingly human, stories. 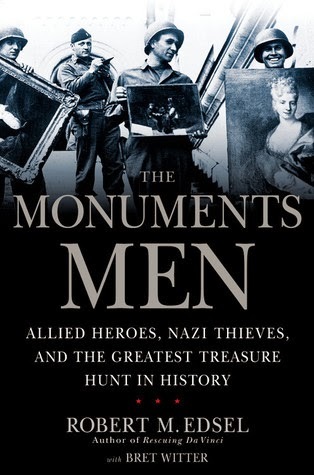 The Monuments Men is another to add to the list. A small handful of art historians, restorationists, and scholars volunteered to find, rescue and protect the priceless works of art that the Nazis are determined to steal, appropriate, or destroy. This effort "marked the first time an army fought a war while comprehensively attempting to mitigate cultural damage." These valiant men (and a few women, too) fought with inadequate supplies, personnel, and transportation and were largely successful. It's impossible to calculate what the loss to the cultural and artistic history of Europe and the world would have been without them. The officers of the Monuments, Fine Arts, and Artifacts section were tasked with several overwhelming jobs. They were to be on the front lines, advising the commanding officers which areas and buildings to avoid destroying or damaging. They were to record the condition of monuments after battles, supervise any emergency repairs and see that no further damage occurred. They were to interview local magistrates and members of the art community to track down pieces of art that had been taken by the Nazis. And then they had to oversee the care, repair, and transportation of any found items back to their original owners, a job that took six years after the end of the war! And for the most part, the Monuments Men worked on their own or with a single partner from the MFAA, covering thousands of square miles. Their journeys took them to locations as varied as the fairy tale castle of Neuschwanstein and the cavernous salt mines of Austria. They were on the front lines and in small windowless offices back at headquarters. They discovered invaluable pieces of art in warehouses and bedrooms and tracked down the Hungarian crown jewels to an oil barrel sunk in a Bavarian marshland. "In the end, the Western Allies discovered more than one thousand repositories in southern Germany alone, containing millions of works of art and other cultural treasures, including church bells, stained glass, religious items, municipal records, manuscripts, books, libraries, wine, gold, diamonds, and even insect collections." That's just astounding. What made this effort even more remarkable is that the Monuments Men didn't just work to save the history and culture of the Allied countries. Their work reached to every artifacts of artistic or cultural significance, including to Germany. "To save the culture of your allies is a small thing. To cherish the culture of your enemy, to risk your life and the life of other men to save it, to give it all back to them as soon as the battle was won...it was unheard of, but that is exactly what Walter Hancock and the other Monuments Men intended to do." These people had worked in museums and libraries and were well aware that the value of these artifacts was far more than monetary. There are quite a few characters and they can be difficult to keep straight, so stick a finger or bookmark in the "Main Characters" list at the front for easy access. It's amazing how much was accomplished by so (relatively) few with so little. "History is more often than not a messy combination of intention, courage, preparation, and chance." The Monuments Men is a testament to that.